Sarah Cardwell is a new mental health blogger. She writes about her own experiences following her diagnosis with Emotionally Unstable Personality Disorder/Borderline Personality Disorder. She is a wife and a proud mum, and also works for the Good Things Foundation, a social and digital inclusion charity. The thing some people don’t understand is that we all have mental health. Everyone is somewhere on the line between good and bad mental health, exactly the same as they are with physical health. What I find fascinating is that with all the focus on children and obesity, mental health in schools is often overlooked. Unstable Personality Disorder, mental health is a daily topic in our house. But we don’t often use that name, we talk about feelings and emotions. I’m not naive enough to believe I have found the answer to adolescence. We’ve all been there and I know things might change, but right now my children express their emotions. And I teach them that that’s OK, it’s positive and it’s good for them. 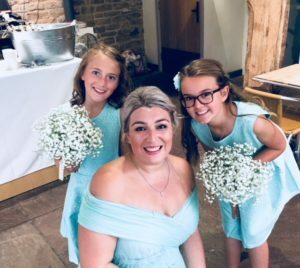 The conversations predominantly started when I heard from a school teacher that my youngest daughter couldn’t talk about “Grandma or Kirsty” because it upset me too much. We lost my mum in 2015, six weeks after her diagnosis of Ovarian Cancer. Kirsty was my best friend and close with the girls. Sadly she had her own battle with depression, and lost that battle when she took her own life in September 2016. I couldn’t (and still can’t) understand these as an adult, so how could I expect my children to? Hearing this broke my heart, and I realised they didn’t know how much I loved talking about both my best friend and mum, but that also crying and being upset was OK.
Well, firstly I had to be honest. I wrote a blog about my conversation with them both about my diagnoses. They don’t need every detail, but they are clever and I felt that whispers behind backs, lies and secrets were only going to break my trust with them. I never want to do that. They both wanted photographs to look through too. Secondly, I had to let them both know how much I love talking about Grandma and Kirsty. I often ask, if they’ve not mentioned them in a while, “Do you remember when Grandma fell off the stool in the kitchen?” “Can you remember reading to Kirsty?” And sometimes we laugh and sometimes we cry, but they know that both of those reactions are OK. There is no “right” way to handle bereavement or other emotions and feelings. Everyone is different. They both have an action plan for when they are angry. Again not always followed, (they are kids and still do the complete opposite at times), but I believe anger is a powerful and necessary emotion, and bottling it up is fruitless. So I tell them to express it. That might be through shouting, counting to 10, or taking a time-out in their room. Whenever I tell them off, and I do, whatever I say and whatever punishment is agreed, I tell them I love them and hug them. Don’t get me wrong I still get the whole “No you don’t love me”, “My life isn’t fair”, “You make me do everything” and refuse my hugs and love, but we never go to bed without a kiss, a cuddle and “I love you”. I’ve also looked for help. My girls use Big Life Journal products which help them think with a growth mindset. I’m also very passionate about mental health being introduced in schools. To me it is as important as Physical Education. So I’ve signed and am sharing a petition to get better mental health provision in schools. Finally, I want to raise two strong women who learn to handle their emotions, who believe in themselves and who know they are loved. They are also mini-bad-asses at karate! Visit Sarah’s blog at www.sarahsthinkingagain.blog to read more articles on mental health. My Possible Self is a mental health app that uses clinically proven content to help you reduce stress, anxiety and mild-to-moderate depression. Get the app here.